Home > News and media > Features > What is the value of brilliance? 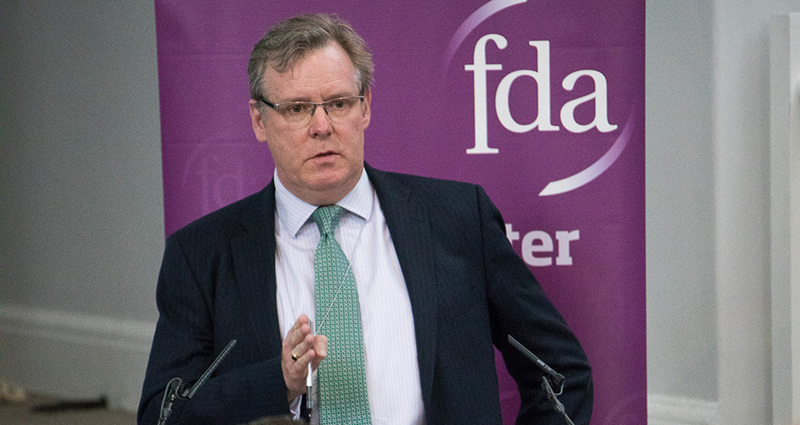 FDA Vice President Tony Wallace asks, if the acting Cabinet Secretary thinks all civil servants are brilliant, then why have they not been rewarded for it like their public sector colleagues? Last Friday I was a Brilliant Civil Servant! We all were, all 420,000 of us. Mark Sedwill, acting Cabinet Secretary told us so; and for the record, I do appreciate the compliment. To be honest though, I am not a fan of overblown epithets. They tend to leave you with nowhere left to go linguistically speaking; consider President Trump’s somewhat odd description of our “highest level of special” relationship with the US; couldn’t he make it just a tiny bit more ‘specialer’? Well, how brilliant is Brilliant and what is it worth? I have paid for some brilliant albums, I have paid for some brilliant meals I have paid for some brilliant service. Brilliance costs, it doesn’t come for free, and I‘ve just received notice of the value that my employer places on my ‘Brilliance’. It rather took the shine off of Mark’s kind words. The pay cap has been lifted across the public sector! I know because ministers keeping telling me that it has. To be fair, for some professions like teachers, doctors and prison officers, it has. Although I don’t anticipate that they will be having a slap-up feed off the back of what are still below inflation rises, nevertheless they are above 2%, and I do not begrudge them a single penny. But what of the Brilliant Civil Servants? Pay increases across the civil service are being held at 1.5% or less. Not some pay rises, not pay rises in a couple of departments. No, pay is set - some might say capped - at 1.5%, right across the civil service. We are now clearly the poor relations of the public sector. Where have all those ministers who were shouting for a fair deal for their departments last autumn scuttled off to? For me and many like me, HMRC’s 1.5% actually means 1.1%! And before any clever clogs shouts “automatic pay rises”, any such rises were removed from my department more than eight years ago. To add insult to injury, after eight years in my present grade I am now closer to the bottom of my pay scale than I was last year and before the generosity of my employer was imposed upon me. This is an ‘Alice through the looking glass’ pay settlement. My employer was invited by the Treasury to consider whether it should make a business case to exercise some flexibility under the new “more relaxed” pay remit process; the polite one with the raised cap. My union asked HMRC to make such a case and you might have thought that, given the pressures on departments to recruit and retain the brightest and the best to deal with our imminent departure from the EU, that they would have been delighted to make that case, wouldn’t you? Well, no. HMRC didn’t think it was appropriate or necessary to make such a case this year. Maybe next? Last year we, in HMRC generated £605.8bn for UK public services and other government priorities, a 5.4% increase on the previous year. We secured an additional £30.3bn through our work to tackle error - that’s £30.3bn to spend on the services our nation desperately needs, and more than 15 million of our citizens are now using personal digital tax accounts; that’s almost a quarter of the entire population of the United Kingdom, man, woman and child. That is Brilliant, but no more brilliant than the work of my colleagues in many other Government departments. But for all that, dear reader, the value my employer places on the delivery of its Brilliant Civil Servants is nothing less than an insult. Sadly, I anticipate that the same insulting lack of value will be replicated across the rest of the Brilliant Civil Service. Mark was right - “Our nation is lucky to have us” - where else could you buy such Brilliance so cheaply?